No, I’m not talking about the blood-sucking plant of the Little Shop of Horrors named Seymour. 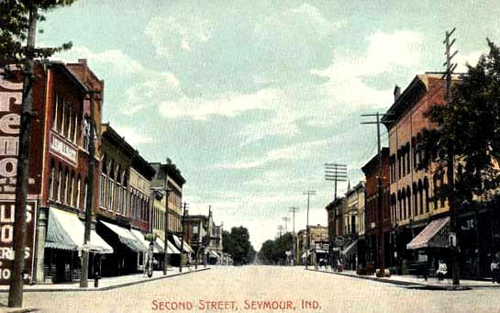 Although there may be a little bit of blood sucking associated with Seymour, Indiana as well. John Mellencamp sings at Walter Reed Army Medical Center at a free performance for wounded warriors, family and staff April 27. About 200 wounded soldiers, staff and family members attended the event, providing a small but energetic crowd. Date 27 April 2007, Wikimedia Commons. 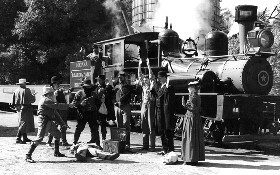 After the end of the War Between the States (alternatively named the War of Northern Aggression), there was little work and nearly no prosperity in Seymour, Indiana, a town that had held many sympathizers for the Confederacy, and had even been home to a double handful of saboteurs and provocateurs who went out to aid John Hunt Morgan’s raid into Indiana. Another person of note that went forth to conquer from Seymour was John Mellencamp. His raids continue.